Eschew the tourist crowds and head to Valley of Fire State Park and Eiffel Tower Viewing Deck. Step out of Las Vegas with an excursion to Hoover Dam in Boulder City--about 50 minutes away. There's still lots to do: make a trip to Bellagio Fountains, try your luck at Bellagio Hotel and Casino, see the interesting displays at Madame Tussauds - Las Vegas, and take in breathtaking views at Red Rock Canyon National Conservation Area. To see other places to visit, where to stay, maps, and other tourist information, refer to the Las Vegas trip planner . Manchester, UK to Las Vegas is an approximately 14-hour flight. You can also do a combination of train and flight. The time zone difference when traveling from Manchester to Las Vegas is minus 8 hours. Traveling from Manchester in August, things will get much warmer in Las Vegas: highs are around 45°C and lows about 29°C. Finish your sightseeing early on the 5th (Mon) to allow enough time to travel to San Diego. Start off your visit on the 6th (Tue): enjoy some diversion at Petco Park and then meet the residents at San Diego Zoo. Here are some ideas for day two: see the interesting displays at USS Midway Museum and then let the kids burn off some steam at Balboa Park. To find reviews, traveler tips, photos, and more tourist information, read our San Diego vacation planner. Getting from Las Vegas to San Diego by flight takes about 3.5 hours. Other options: drive; or take a bus. Traveling from Las Vegas in August, expect nights in San Diego to be a bit cooler, around 23°C, while days are colder, around 30°C. Cap off your sightseeing on the 7th (Wed) early enough to travel to San Jose. You'll discover tucked-away gems like Monterey Bay and Dolphin & Whale Watching. Get out of town with these interesting San Jose side-trips: Monterey's Tasty Olive Bar (in Monterey) and Carmel (Carmel River State Beach & Seventeen Mile Drive). Next up on the itinerary: take your sightseeing to a higher altitude at Mount Umunhum. Plan a trip to San Jose easily and quickly by telling Inspirock to suggest an itinerary. Traveling by flight from San Diego to San Jose takes 3 hours. Alternatively, you can do a combination of flight and train; or drive. Traveling from San Diego in August, you can expect nighttime temperatures to be little chillier in San Jose, with lows of 18°C. Finish up your sightseeing early on the 10th (Sat) so you can go by car to San Francisco. San Francisco is known for nature, museums, nightlife, shopping, and childrens museums. Your plan includes some of its best attractions: take in the views from Golden Gate Bridge, make a trip to Golden Gate Park, play a few rounds at Lincoln Park, and examine the collection at Cable Car Museum. 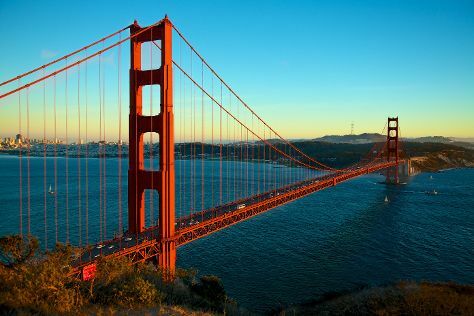 To see other places to visit, more things to do, where to stay, and tourist information, go to the San Francisco route planner. Traveling by car from San Jose to San Francisco takes an hour. Alternatively, you can take a bus; or do a combination of bus and subway. While traveling from San Jose, expect slightly colder days and about the same nights in San Francisco, ranging from highs of 26°C to lows of 17°C. Cap off your sightseeing on the 13th (Tue) early enough to travel back home.